After Morgain Le Fey has transformed the world by removing BATMAN, SUPERMAN, and WONDER WOMAN from history, the transformed heroes of Earth unite as the Justice Society International and the Justice Arcana to combat Le Fey's plans. When Superman restores the Earth's proper history, Booster Gold finds himself alongside the heroes both familiar and new (Skyrocket). The Justice League was a team composed of the greatest heroes of the modern era. Following the difficulties of the Legends event, a need was recognized for the return of the Justice League of America. By manipulating events, MAXWELL LORD was able to establish a team of heroes which earned UNITED NATIONS sponsorship. For several years, a constantly shifting line-up of heroes operated from JUSTICE LEAGUE INTERNATIONAL EMBASSIES across the globe. In recent years, the Justice League has operated without a United Nations mandate in order to avoid the political problems that accompany such a sponsorship. Booster Gold was hand-picked by Maxwell Lord to add power to his fledgling League. As Booster's business and personal life disintegrated around him, the Justice League became his home and family (and considering the case of Power Girl's Cat, also his pets). 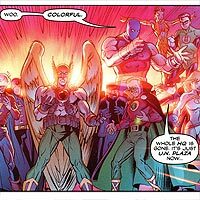 With the 31st-century universe in disarray, Terrance Magnus and his sister Terri used the genetic manipulation facilities of Cadmusworld to reanimate the long dead Justice League. 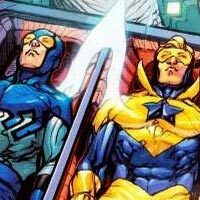 Booster Gold and BLUE BEETLE II were found in suspended animation on the planet Takron-Galtos. Sheriff Tariq helped the pair survive an attack by Blue Beetle IV and later had the pair sent to Cadmusworld to be used against the rebelling Justice League. 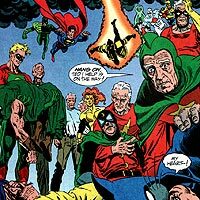 The first major team of super heroes, the Justice Society of America has been active off and on since World War II. Membership is largely determined by heredity, and many current members the descendants of previous members. Unhappily, Booster Gold's first experience with the Justice Society was when they were mind-controlled into working for the villain SONAR. 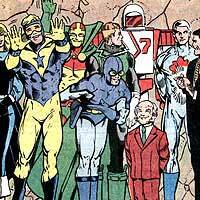 Since that time, Booster has worked with several incarnations of the team, both young and old.